(Chelsea, MA) Having originally opened to critical acclaim at The Duke on 42nd Street in August 2015, Laufer’s hard hitting play is the most recent production from Chelsea’s Appolinaire Theatre Company. Resident company of Chelsea Theatre Works, Appolinaire endeavours to “offer audiences direct, intimate encounters with works of modern and contemporary theatre.” Informed Consent does exactly that. Deborah Zoe Laufer is an accomplished writer, marrying the universal with the personal, in this heart-wrenching story of one woman’s struggle to beat fate and save her daughter…“whatever the cost”. Informed Consent was inspired by the real-life legal case of the Havasupai Tribe of the Grand Canyon v. Arizona State University. Young (director) effectively uses the black box space to depict this conflict, contrasting the rocks of the Grand Canyon against the image of a DNA helix hung on the opposite side of the stage. Both act as visual reminders of the opposing creation narratives that drive the action of the play. Particular credit must go to Becca A. Lewis, who plays the obsessed genetic anthropologist, Jillian, with great conviction and pathos. Jillian is presented with ‘the opportunity of a life time’ when social anthropologist Ken (Arthur Waldstein), asks her to investigate the diabetes epidemic in the Havasupai Tribe. Jillian’s fanatical belief in the importance of genetic research stems from her awareness that her daughter will get early onset Alzheimer’s. Determined to find a cure before her daughter gets the disease, Jillian perceives the Havasupai’s plight as a perfect opportunity to research an “unpolluted gene pool”. With a moving performance from Deniz Khateri as Arella (spokesperson for the Havasupai Tribe) Arella pushes Jillian, and the audience, to confront the fact that science is not a synonym for truth. For the Havasupai Tribe, Jillian’s ‘discoveries’ about the tribe’s migratory patterns are an insult, threatening their identity and spiritual beliefs. As the play progresses, Jillian’s faith in science dwindles as the Alzheimer’s worsens. The play ends with Jillian determined to tell her own story, to ensure her daughter is left with more than just a memory of a mother who doesn’t recognize her. Young plays with the storytelling form to add warmth and occasional splashes of humor, to these cerebral musings. Whilst credit must be given to Khateri for her energetic transformation into Jillian’s daughter, seven year-old Natalie, I was left feeling that a more believable mother-daughter relationship would have increased our sympathy for Jillian’s plight. Overall the cast did well to maintain the fast pace throughout, as Laufer’s script is in danger at points of becoming an academic debate on stage. ‘Are humans more than just their genetic code?’ ‘Who has the right to tell you who you are?’ These questions underpins the fast-paced exchanges between Jillian and those around her: her loving husband, Graham (Demetrius Fuller), friend of the Havasupai, Ken (Arthur Wald stein), the uncompromising matriarch Dean Hagan (Paola M. Ferrer) and of course the fiercely intelligent Arella (Deniz Khateri). Informed Consent serves as a powerful reminder of your right to “tell your own story”. Forceful and thought provoking, Informed Consent is a must see. 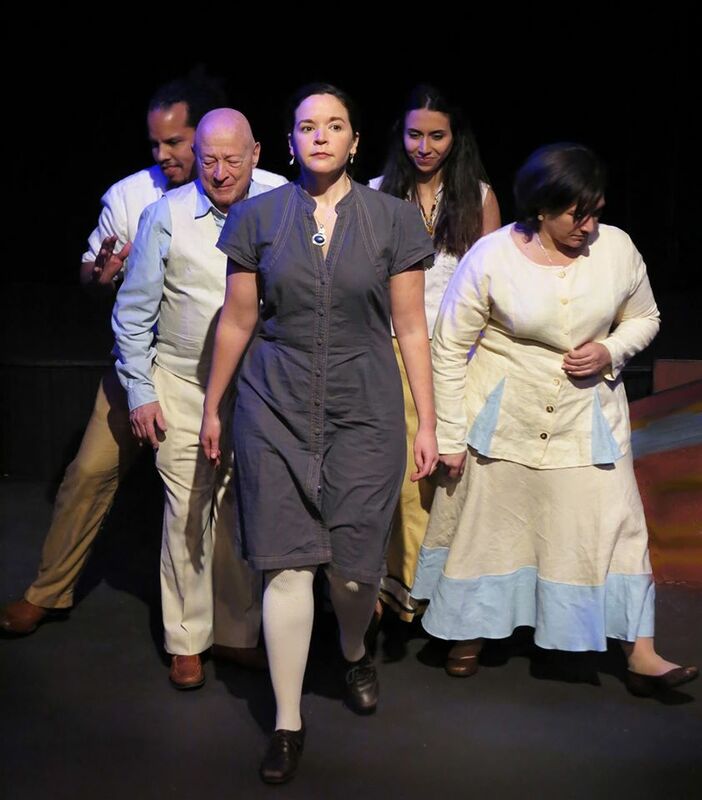 This entry was posted in Drama and tagged 2015, 2017, Alexa Lambert, Alzheimer’s, Arthur Waldstein, August, Becca A. Lewis, Camilo Atehortua, chelsea, Chelsea Theatre Works, Chrissy Tina, Dale J. Young, Danielle Jacques, Deborah Zoe Laufer, Demetrius Fuller, Deniz Khateri, DNA helix, February, Havasupai Tribe of the Grand Canyon v. Arizona State University, Informed Consent, MA, March, Paola M. Ferrer, Paola M. Ferrer Collazo, Polly Goss, The Duke Theater by Polly Goss. Bookmark the permalink.